2 October 2018 – DOHA, Qatar: The countdown to INDEX Qatar 2018 is underway, with less than six weeks to go until the three-day interiors show returns to Doha, against a backdrop of sustained growth for the fit-out market across the country. 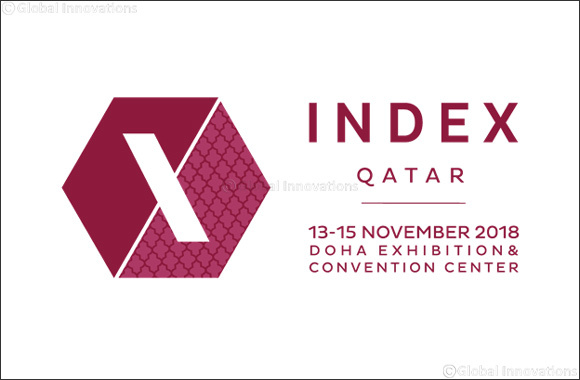 INDEX Qatar will gather hundreds of international product manufacturers, interior design firms, and other visitors at the Doha Exhibition & Conference Centre from 13th to 15th November, 2018. Last year’s debut exhibition showcased the products and services of over 86 exhibitors from 17 countries, and the 2018 edition will see even more major players from across the industry taking part. The exhibition is expected to attract close to 5,000 people from across all sectors of Qatari society - from interior designers and architects to project managers, importers and distributors - across the full spectrum of retail, hospitality, residential and commercial design, as well as the general public. Qatar is a booming market for global suppliers, too, with international companies being particularly well-represented at the exhibition. It is a remarkable time for the industry across the nation. A report commissioned by INDEX Qatar – and compiled by market analysts Ventures – has estimated the spend on interior contracting and fit-out projects to now be worth QAR 5 billion in Qatar every year. A spokesperson for Ventures said: “The interior design and fit-out industry is expected to flourish in Qatar as demand for new residential, hotels, commercial real estate, schools and hospitals continue to grow. Owners of existing structures, whether residential or commercial, will be under pressure to optimise the value of their projects by refurbishing them in order to maintain their market value. With over 28,000 more residential units forecast to be built across the country by 2019, as well as mega-projects including Lusail City, Hamad International Airport Expansion, the Doha Metro, the World Cup Stadiums and Msheireb Downtown all proceeding at pace, there is no shortage of opportunity in the Qatari market. “We are thrilled to be launching the second edition of INDEX Qatar in a mere six weeks’ time,” said Jaafar Shubber, INDEX Qatar event director. “Qatar now represents arguably the largest untapped business opportunity for interior, fit-out and construction suppliers of any market in the Middle East. It continues to flourish in the build-up to hosting the FIFA World Cup 2022 and, in the longer-term, towards the continued execution of the Qatar National Vision 2030. Both the investment and creativity across the interiors and wider construction industries in Qatar are inspiring, and we look forward to showcasing the industry for businesses and consumers alike. Firms already confirmed to attend INDEX Qatar include Cristal de Paris, Pliteq, Lisowski Glass Studio, Maze Creative Concepts, Arqadia, and Algedra Furniture, amongst many others. Following their huge success at last year’s launch show, INDEX Qatar’s three days of design-led conversation will return, with Design Talks panels featuring leading interior and architectural specialists from around the world.